Crawley Town suffered a narrow 1-0 defeat at promotion-chasers MK Dons. In a match which Reds probably had the better chances to score, MK Dons took advantage of a defensive slip by skipper Dannie Bulman to seal their fourth successive victory with a 42nd minute goal by Kieran Agard. Reds made two changes to the side which drew 1-1 with Macclesfield last week with Panutche Camara and Reece Grego-Cox replacing Dominic Poleon and Josh Payne. There was no place in the squad for either Filipe Morais or Luke Gambin. Coach Craig Brewster returned to the management team working with head coach Gabriele Cioffi and assistant Nathan Rooney, following his appointment on Friday. Reds went close to scoring twice in the first half. hour when firstly George Francomb curled a shot against the crossbar. MK did not create much in the first half one of the few chances being when Jake Hesketh forced Glenn Morris into making a good save. Bulman volleyed an effort for Crawley over the bar from Francomb’s corner. But MK went into the break with the lead when four minutes before half-time Bulman ducked under a long ball by goalkeeper Stuart Moore, allowing the ball to go to Agard who ran through and netted with a comfortable finish. Reds went back on the front foot at the start of the second half when Palmer found himself in a one-on-one with Moore but fired the ball straight at the ‘keeper. Francomb ended a goalmouth scramble but driving a shot wide. 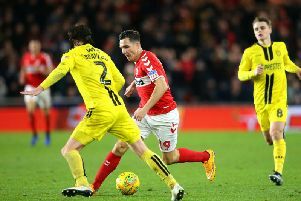 Reds’ fans heartbeats sped fast from another defensive mix-up when Joe McNerney played the ball back for Morris, who was not where he was expecting him and the ball rolled narrowly wide of his own goal. Grego-Cox played in Matty Willock for a chance on goal but his shot flew off-target. Cioffi replaced Willock with Ashley-Nathaniel George for the last 25 minutes and he nearly created a good effort with a run into the box, but his final ball could not be reached by either Palmer or Grego-Cox. Cioffi received a yellow card for protesting when the referee frustatingly stopped play for a foul in Crawley’s half, just as Grego-Cox was through on goal. Poleon came on for the last few minutes for Grego-Cox as Reds’ trip to Stadium MK ended in defeat. MK Dons: Moore, Lewington (capt), Walsh, Cisse (Houghton 77), Gilbey, Aneke, Hesketh (Wheeler 83), Agard, Martin, McGrandles, Brittain.